Hi everyone! I’m 6 weeks in now so it’s time for my third blog post. At the moment a large amount of my time is being spent on two projects. These are the project in the Winster and Gilpin catchment and the Freshwater Pearl Mussel project, so they will be the focus of this blog post. The Winster and Gilpin project is a 3-4 year habitat improvement project with the aim to identify and investigate issues in the catchments, and implement appropriate restoration/remediation options to allow for recovery. We have completed desk based studies and walkover surveys to investigate pressures, and are now working with local landowners and communities to develop projects for delivery. One such project is situated at Crosthwaite School. Here a culverted section of watercourse runs underneath the school field, overflowing during the winter months causing erosion and damage to the field. The current proposal is to de-culvert the beck to create an open channel. As the school use the field there are also proposals to create a nature/wildlife pond with an educational dipping platform and a pathway that allows safe travel through the field to the local church. Last week I was out speaking to the landowner and school to discuss proposals and conduct test digs at the site. Test digs allow us to find the route of the culverted/piped section of watercourse, giving us an idea of its current location before plans are formalised. 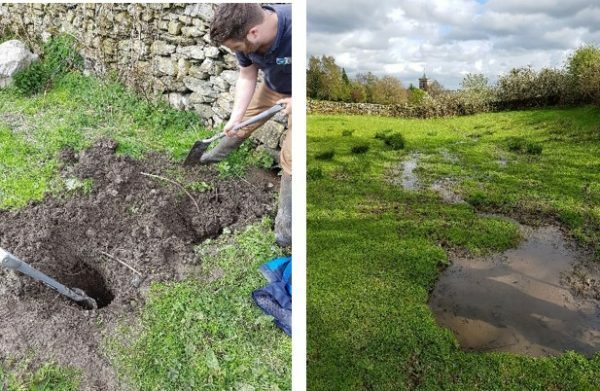 It also allows us to determine if opening the beck is a viable option, depending on the water depth and route of the watercourse. I will be conducting further test digs for this project to aid in project proposals. I have also been organising site visits to other project sites in the Winster and Gilpin catchments. This involves liaison with landowners to find suitable dates and times to visit sites and discuss proposals. As this is a busy time of year in the farming calendar some site visits and proposals have been postponed due to lambing/calving. It is important to remember these dates and take into account the needs of landowners and farmers during busy periods. Over the last two weeks I have also worked on progressing the Freshwater Pearl Mussel project. This is a BIFFA award funded project that is coming to an end this year. As the new project officer, I am working on the last few bits of work that need to be done before the project finishes. The main item I have been working on is the juvenile habitat investigation that I mentioned in my last blog post. Last week I visited the Freshwater Biological Association (FBA) labs on the shores of Lake Windermere. Here I had a meeting with Ceri Gibson (Pearl Mussel Project manager) and Heather Marples (Pearl Mussel Officer). We covered the project so far to get me up to speed, recent updates, next steps of the project and then a bit more detail on the juvenile habitat investigation. I was also given a tour of the facilities, including the mussel trays and outside tanks, which was really interesting! The juvenile pearl mussel habitat investigation involves collecting both dissolved oxygen and redox data from controlled conditions to gain a better understanding of the limitations of collecting this data. It is also hoped that measurements can be used to understand the conditions that juveniles seek, and may aid in site selection for mussel re-introductions. 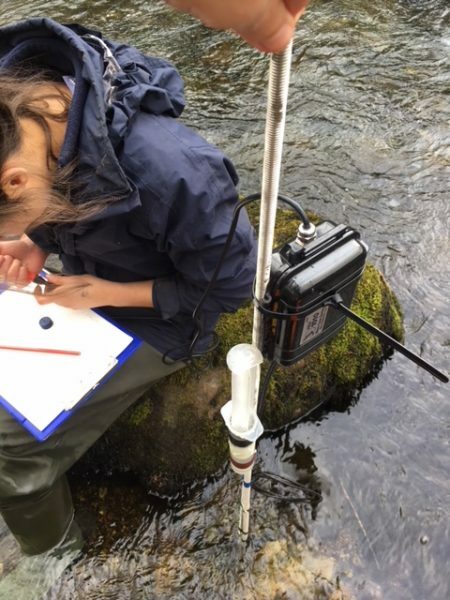 Here at SCRT we have been collecting dissolved oxygen data in the field for a number of years, using our own in-house designed oxygen probe. Last week I had my first outing to collect measurements using the probe, and Jayne trained me up on how to gather the data, as well as how to calibrate the probe prior to data collection. The work involves sampling from tubes installed in the beck to measure oxygen within the gravels. Sometimes these tubes are difficult to find or need replacing as they can be washed away in high flow events. We use a bathyscope to search for them and to aid work underwater when replacing lost tubes. Going out in the field and using the equipment has given me a better grasp of what needs to be done and a greater understanding of the data collected. It was really beneficial and has helped me to write up a method statement for the upcoming investigations. 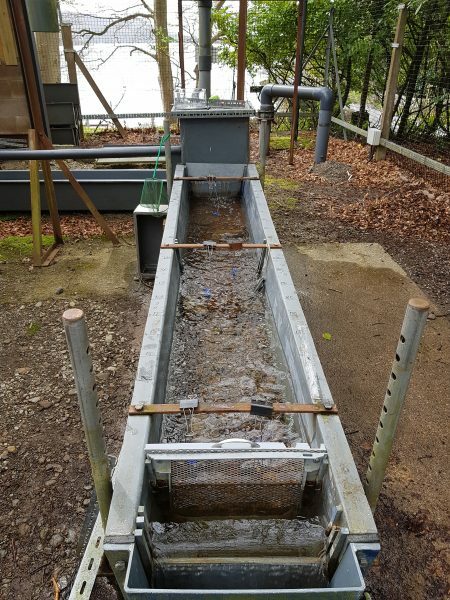 I returned on a second visit to the FBA recently to install dissolved oxygen sampling tubes into the flume tank. We will be collecting dissolved oxygen data from this tank, which houses some of the mussels reared at the FBA hatchery. I had a great day out a couple of weeks ago tree planting in Colwith on the Little Langdale Beck with Jayne and a couple of willing volunteers! We planted a mixture of native species along a restored and regraded section of riverbank. 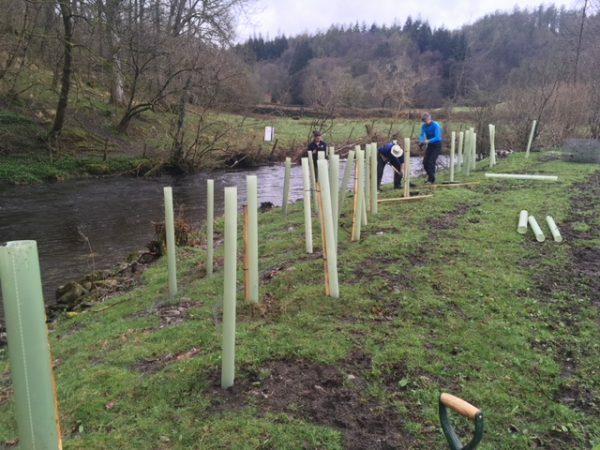 This work was also part of the freshwater pearl mussel project and the trees will provide shade over the beck, as well as help to stabilise the banks and prevent erosion. As well as working on the project work outlined above I have also managed to fit in a first aid course, a site visit to a farm to complete a walkover and discuss project opportunities, GIS mapping work and completed my first set of reports for the SCRT trustees! Lots going on but really interesting, exciting work and I’m meeting lots of new people too!